Jeans in a faded grey with a tailored waistband and belt loops, and with a zip. Slightly stretchy. Decorated with black embroidery and diamante. The hem on both legs is turned up and features an embroidered lace fabric. Jeans in a faded grey with a tailored waistband and belt loops, and with a zip. Slightly stretchy. Decorated with black embroidery and diamante. The hem on both legs is turned up and features an embroidered lace fabric. Casual basic jeans that can be combined with practically any top. 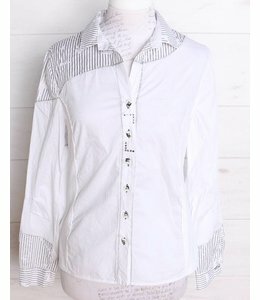 You will also find the matching blouse ECW161002804 col. 01102 Bianco Psiche in our Shop.